The United States and the United Kingdom are teaming up to fight against a growing threat from space: sun storms. An international space weather agreement between the two countries will expand collaboration to protect against the potentially damaging effects of solar radiation, which is due to increase as the sun ramps up activity toward a maximum in 2013. The U.S. National Oceanic and Atmospheric Administration (NOAA) and the United Kingdom Government Office for Science announced today (June 26) that the nations will share space weather resources and scientific expertise to guard valuable power and electronic infrastructure from solar outbursts. "To effectively manage space weather threats, strong collaboration is required among scientists, forecasters, emergency planners, industry and others," Kathryn Sullivan, NOAA deputy administrator, said in a statement. "I am pleased that, in recognizing the seriousness of these threats, the U.K. and NOAA are working together to better understand and forecast space weather and to use that knowledge to safeguard lives, livelihoods and property." With a growing percentage of the global population using electronics on a daily basis, protecting against this threat is becoming increasingly vital, experts say. Today's announcement follows a series of efforts to encourage and expand collaboration across the pond. U.K. Prime Minister David Cameron and U.S. President Barack Obama emphasized the importance of a space weather partnership in London in May 2011, and at the White House in March of this year, according to NOAA officials. Earlier this year, the U.K. Met Office, the government agency tasked with monitoring the country's weather forecasts, expanded its research to include investigations of how space weather affects the planet. Scientists at the Met Office are adapting current weather and climate models to incorporate the effects of solar storms on a layer of the Earth's atmosphere called the thermosphere, which is a region about 56 to 373 miles (90 to 600 kilometers) above the Earth's surface. "Space weather is a global challenge that requires a coordinated response," John Beddington, chief scientific advisor for the U.K. government, said in a statement. "The inclusion of space weather in the U.K.'s National Risk Register is evidence that we are already taking it seriously. Today's joint statement will build on this and see the U.K. and U.S. working more closely together to better understand and respond to space weather threats." 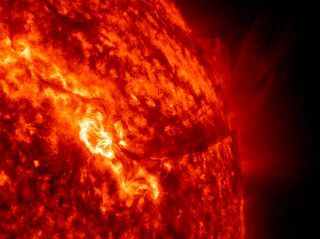 The sun's activity waxes and wanes on a roughly 11-year cycle. The sun recently came out of a slumber and is now approaching an expected level of peak activity, or solar maximum, in mid-2013.